Belgium is a small country in northern and western Europe. It shares borders with France, the Netherlands, Germany and Luxembourg. The capital city is Brussels. Other big cities are Antwerp and Liège. Belgium has been part of the European Union (EU) since the organization started in the 1950s and uses the Euro as its currency. Many of the main government buildings of the European Union are based in Brussels. EU Capital — There is no official capital of the European Union but the main government buildings and parliamentary offices are in Brussels, Luxembourg and Strasbourg in France. Belgium became independent in 1830. Before that date the country was a part of the "Low Countries", an historical region corresponding to the modern states of the Netherlands, Belgium and Luxembourg. This group of states is now called Benelux. The "Low Countries" used to be a set of feudal states between the Holy German Empire and France with different degrees of autonomy. At the end of the Middle Ages, the region was economically and culturally flourishing. However several wars between the Dutch, the Spaniards, the English, the French, the Germans and the Austrians plundered the country. After independence the country became a center of the Industrial Revolution in Europe and participated in the colonization of Africa. During the first half of the twentieth century the country became prosperous again. However the oil crisis of the seventies put the country (and in particular its southern part Wallonia) into an enduring economic crisis. 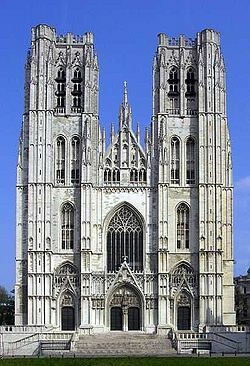 St. Michael and Gudula Cathedral in Brussels, Belgium. Belgium is one of the smallest countries in Europe. The country is about 280 km (about 175 miles) long and about 145 km (about 90 miles) wide. Belgium's winters are mild with cool, windy summers. Belgium is often considered to be one of the low countries because it is mostly flat - the largest mountain is Signal de Botrange at 694 metres. The population of Belgium is just over 11 million. Belgium is divided into three different regions: Flanders, Wallonia, and Brussels. In Flanders most people speak Dutch. In Wallonia most people speak French. In Brussels the people speak both languages. About 80 percent of the Belgian population is Roman Catholic. Other religions practiced within the country include Islam and Judaism. Education is required from six to eighteen for Belgians, but many continue to study until around the age of 23. Free pre-primary schooling (Dutch: kleuteronderwijs; French: enseignement maternel; German: Kindergarten) is provided to every child from the age of 2 years 6 months. In most schools the child can start in school as soon as they reach this age, so class size for the youngest children grows during the year. In the Flemish region, start dates are limited to 6 per year, after a school holiday period and the first school day in February. There are no formal lessons or assessments, and everything is done in a playful way. Although it is not required, more than 90% of all children in the age category attend pre-school. Most pre-schools are attached to a particular primary school. Pre- and primary schools often share buildings and other facilities. Some schools offer special pre-primary education for children with disabilities or other special needs. Primary school (Dutch: lager onderwijs; French: enseignement primaire; German: Grundschule) consists of six years and the subjects given are generally the same at all schools. Primary schooling is free and age is the only entrance requirement. When graduating from primary school around the age of 12, students enter secondary education. Here they have to choose a direction that they want to follow, depending on their skill level and interests. The 1920 Summer Olympics were held in Antwerp, Belgium. Football (soccer) and cycling are especially popular. Jean-Marie Pfaff, a former Belgian goalie, is considered one of the greatest goalkeepers in the history of the game. With five victories in the Tour de France and many other cycling records, Belgian Eddy Merckx ranks high in the list of great cyclists. His hour speed record (set in 1972) stood for twelve years. Kim Clijsters and Justine Henin, two Belgian tennis champions, were highly ranked players. Tourists come to Belgium to see the cities and visit the museums and try out the food. Belgian chocolates are internationally known. Oostende is the most popular beach resort in Belgium. Belgium has ten UNESCO World Heritage Sites including the Historical Centre of Bruges and La Grand-Place in Brussels.